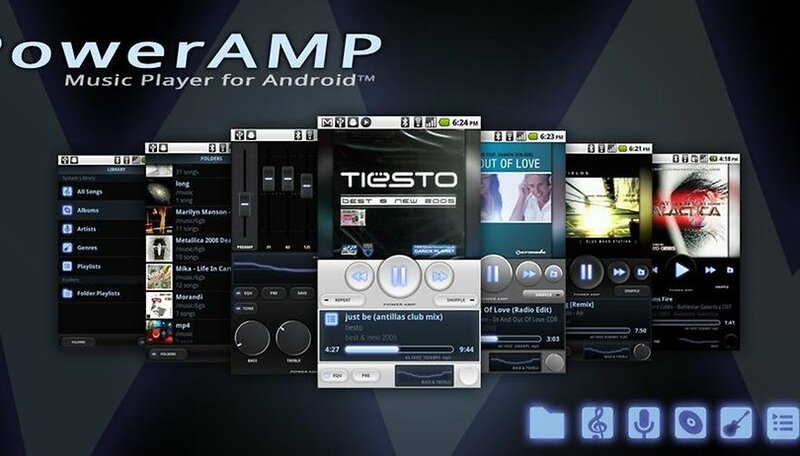 Poweramp Music Player (Trial) - the number one Android music player! Poweramp Music Player (Trial) is probably the most popular music player on Android. But what makes it so special? What makes it stand out from all the other players out there? I put the praise the app generally receives to the test for you to see if the app delivers on all the hype. There's plenty of detail to go through so strap yourself in. While the native Android player already offers some basic features and lets you do what's necessary, there's a lot missing for most users. There are many alternative music players available on Android, so how does an app distinguish itself amongst the masses? Poweramp Music Player (Trial) knows all of this and served up an app so popular it was downloaded more than 50,000 times in just two days. The users are almost as a rule very happy with the app and rightly so, because real entertainment value is provided. But let me get into the details. From the first start up, I was impressed. The design of the app couldn't look any cooler. The blue glow-effect looks dark and mystical, but still ensures that everything will be easily recognized because of the clear contrasts. The setup is intuitive and can be figured easily on your own. When a song is playing, the associated cover appears in full screen above the scrubber bar and on the lower side of the display are all important buttons to keep track of exactly where you're at. Fast-forward and rewind functions are always at your fingertips and respond immediately. In the music library you will find all your albums, listed by their covers in a tile pattern. If any of your albums are missing their covers, the app will offer to download them for you. Everything looks great and it all makes a good impression through its professional look and feel and the strong contrasts and vivid colors. In addition, the user can decide which music folders the app should access. So you can determine where the app looks for your music collection and avoid getting annoying ringtones playing in between songs when shuffling. It really seems as though this app has thought of everything. Besides the beautiful design, the music player includes everything a user could need. Thus, alongside MP3, less-popular formats such as MP4, flac, ALAC, wav, AIFF and m4a are also supported. When you're in the middle of a song and select a new one, there isn't even a load time or stutter: your new song will almost immediately begin playing. The real highlight though are the processing options. The 10-band equalizer can be used in each track to independently adjust their sound and there's 16 default presets for the major genres already included. User-created settings can be stored and applied to individual albums, playlists or songs. You can even set up different profiles depending on the sound output (speakers, cables or Bluetooth headset)! Each song can be easily be played with other settings too, so the user has complete control all of the time and of course, you can simply rotate the control knobs and sliders in a song anytime, and change the bass, treble and balance. Alternatively, when a track is playing you can simply hold down your finger to get a menu. This gesture is quite useful in the app in other ways too, for example, press down on the album cover and you can replace it with Internet-found variants. In the folders for album, artist and genre you can bring up a context menu item specifically to add a tune to a playlist or place them into the queue. Even the settings for headphones are huge. So you can even decide whether, for example, playback continues when the headphones are disconnected or if it resumes when they are connected. You can also enable headphone buttons and lock screen controls. It really does seem like Poweramp has thought of everything! You'd be hard pressed to find another music player that looks this good and has this many features and settings. For me, it is - by far - the best music player on the market. Poweramp Music Player (Trial) knows it has to go the whole hog in order to impress users and this is why all the necessary controls are present and intuitively placed. There's also clever usage of swiping gestures, both horizontally and vertically that are so familiar they just fit perfectly. All this is packed with wonderful animations and clear, high-contrast optics. The specific look and feel of the app can also be changed as you wish and themes added from the Play Store. The app always ran smoothly and without any stuttering. Poweramp Music Player (Trial) is the fastest music player currently available for Android that I've used. Even when you change a song, you don't even have gaps. The album covers are easily downloaded and make a big difference that is really noticeable. Anyone who wants to test Poweramp Music Player (Trial) can download the trial version, which offers the full benefit of the app for 15 days. Tehn, if you want to keep the app, you can buy the Poweramp Full Version Unlocker for between $4-$5, depending on when you buy and where from. The app is absolutely worth every penny, whatever you pay for it! Poweramp Music Player (Trial) is number 1! That is beyond question. No other player on Android even comes close. Based on the hype, my expectations were high and were exceeded in reality. Actually, I can only say good things about this app, I was truly spoiled. Whether you're looking for lots of features, smooth operation, quick speed or slick design, this app brings everything. Been using it for years. The one thing you could put in the bad category is lack of chromecast support. so the most important to me is the fact that this player will play the wave files. I went through all the converting to MP3 I wanted to with. the play music app. I don't have a quality issue either as it sounds fantastic to me. I paid for it so I guess that says it all. I used paid Poweramp before I discovered DFX. Of course the player is far not as sophisticated as Poweramp but the quality of the sound is unbelievable. Witch is for me the most important when dealing with music on a smartphone. This player is really nice, for me the number one is "Music Folder Player (original)". Poweramp Music Player is a music player for Android that enables you to play songs in all of their usual formats: mp3, mp4, ogg, wma, flac, wav, ape, wmv, tta, mpc and many more. Other features of Poweramp Music Player include optional crossfade and gapless playback. For me the quality oft sound is the only thing hat counts. In this matter there is only one acceptable player: the Neutron music player! Poweramp is my first and only music player. When I bought my first Android phone years ago, I tried 20+ music players and Poweramp was the only, I repeat, the only one of them to actually recognize all my mp3 music files (which were all converted by Sony Sound Forge, btw, so there shouldn't be any problems). Since then, I never had a single problem or any unsatisfactory experience with the app. This is by far the best buy (Android app wise) I've ever made, alongside the SwiftKey and Apex.